Another of Bellis’s still life paintings which depicts fruit, flowers or seafood in careless heaps, evoking the abundance of a golden age. These are huge, juicy oysters – some still nestling in their pearly white shells, some already scooped out and eaten; whilst the lemon has been squeezed and left with pips protruding. 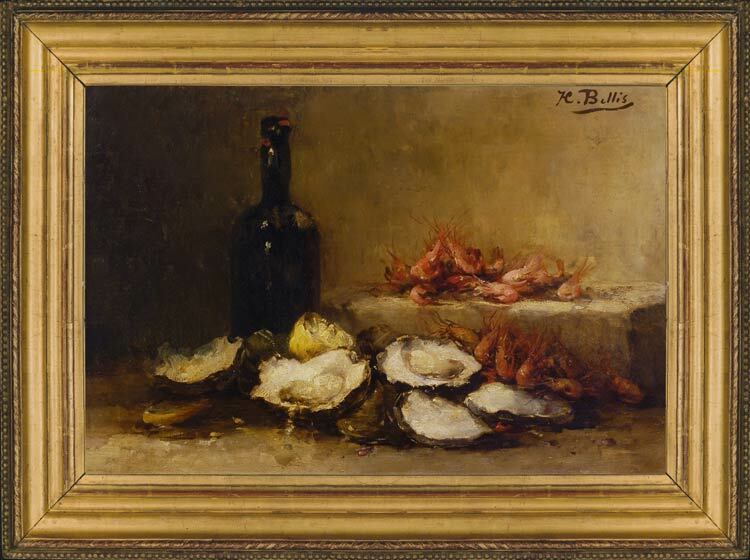 Bellis’s style is painterly and descriptive, the light summoning up a warmly lit interior where the riches of the sea surround a glossy bottle in an enticing snack. Note the wonderful whiskeriness of the shrimps. Hubert Bellis was a Belgian artist, specializing in still life paintings, mainly of fruit and flowers. He was born in Brussels in 1831 and died in 1902 at Saint-Josse-Ten-Noode; he attended the Académie de Bruxelles under François-Joseph Navez and Henri de Coene. Early in his career he worked as a portraitist; he then became a decorative painter, remaining so until 1875. Works in public collections include Martita, and various paintings in the Musées d’Amiens, Amsterdam, Bruxelles, (Chrysanten), Liège, and Louvain.